Back in the early days when I was selling, I’d dream about such a thing happening. Well, that’s wrong, it was more of a nightmare really. Obviously, if I’d gotten that reaction from a sales prospect, I’d simply got the pricing wrong. You can imagine my heart rate…. So, you can now also imagine my delight in being able to help other sales people and business leaders avoid exactly that situation. It’s a great privilege and an exceptional honour to be able to help so many people solve this huge business issue, and genuine nerve shredding problem. Put simply – How do you price your products/services so that your prospect thinks – wow, what a no brainer – whilst you get a high sales conversion rate, high profits and a grateful and delighted client? It’s not easy…but your can do it, and to get you started immediately by downloading this free report. It will take you – stage by stage – through the process you must follow to get more prospects to say yes, at higher prices, more often. Structure your sales presentation and your sale proposal in this way and see what a difference it makes to your business. 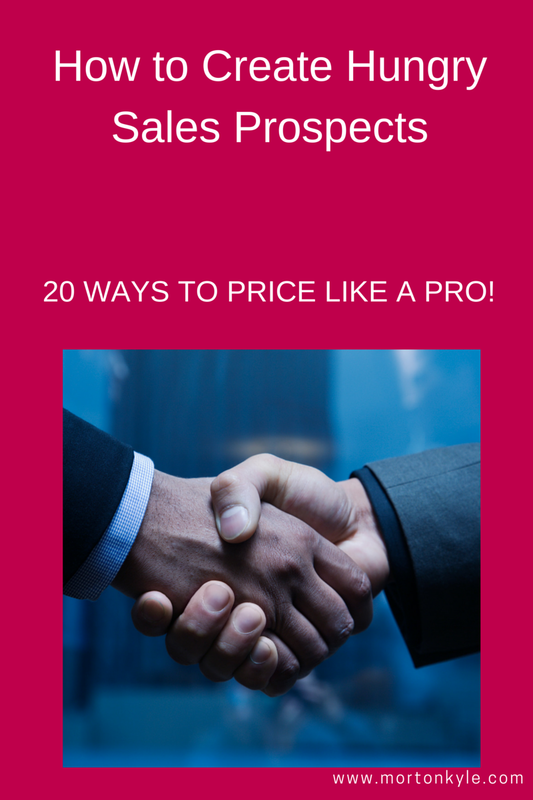 Here’s the link – How to Create Hungry Sales Prospects (20 Ways to Price Like a Pro!). Download it and once you’ve had a chance to digest, let me know how you get on. Likewise. if you have any questions – let me know those too.